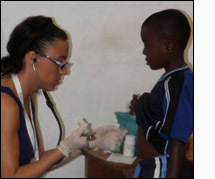 I recently returned from a medical mission trip to Haiti. On arrival to Port-au-prince, we traveled to Cap Haitian. We were then transported to Bod Me Limbe, a small, rural village in northwest Haiti where we would be based for the week. Our first day, we unpacked and organized all of our supplies. Throughout the week, we traveled to 5 different pediatric outreach clinics that we set-up in various sites like classrooms, churches, and shanty towns. During clinic, I was exposed to many patients with varied pathology including end-stage, uncontrolled disease; everything from perforated ear drums to congestive heart failure. In addition, the setting forced us to become creative with the resources that were available to us. I also learned so much about the culture through my interactions with the parents, translators, and local healthcare providers. The more I immersed myself in my surroundings, the more enriched my entire experience became. Taking nightly walks through the different villages with our translators allowed us to converse about the healthcare, politics, and family values of the country. Future goals include not only returning on another mission trip with the same organization, but also improving long term follow-up and data collection to ensure I am helping to make an impact in patient care. This trip has sparked a passion in me to learn as much possible about productive, efficient ways to impact global health in a positive, permanent way.